A Scarborough team's research eventually could change the way kidney disease is treated and save thousands of lives. 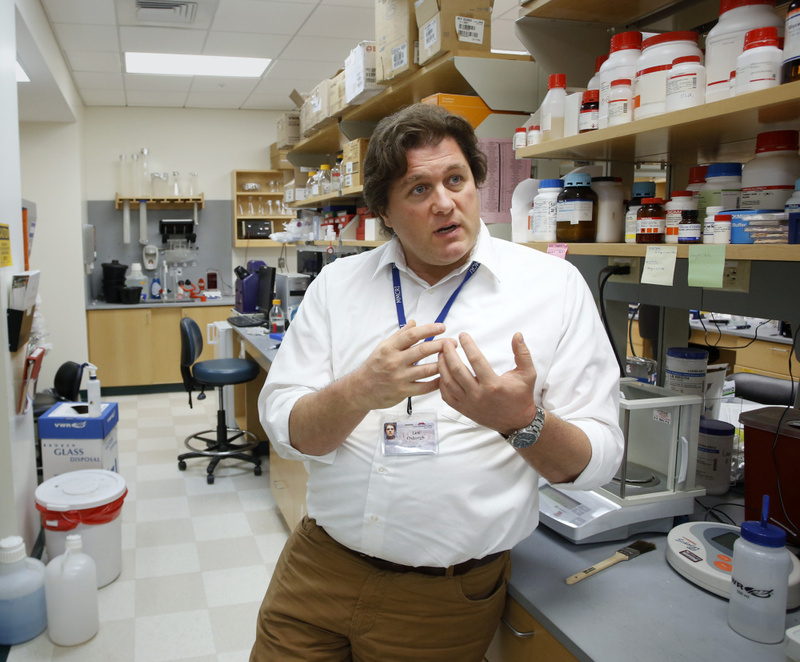 SCARBOROUGH –– When Dr. Leif Oxburgh peers through the microscope at his Maine Medical Center Research Institute lab, he sees more than a collection of cells. He’s studying how embryonic cells become adult kidney cells – and how to then grow kidney tissue from those cells in petri dishes. One day, he hopes the research will lead to scientists growing kidneys in the lab. The research could change the way the world treats kidney disease, and eliminate or greatly reduce the need for kidney transplants. If a lab-grown kidney sounds like the hallucinogenic daydream of a frizzy-haired mad scientist, don’t be deceived. Oxburgh has already achieved scientifically verifiable results, having successfully grown a tiny part of a kidney in his lab. The kidney tissue measures 1/10 of a millimeter and can only be seen under a microscope. But it could be the beginnings of a groundbreaking transformation in how doctors treat kidney disease. The minuscule components Oxburgh has grown – held together with silk – could eventually lead to full laboratory-grown organs. Those organs, perhaps decades from now, could be used for kidney transplants, eliminating the need for long waiting lists and lengthy times on dialysis. More than 4,000 people in the U.S. died while waiting for kidney transplants in 2014, according to the National Kidney Foundation, with an average wait of 3.6 years for those who receive a donated organ. About 80,000 people are on the waiting list for a kidney. 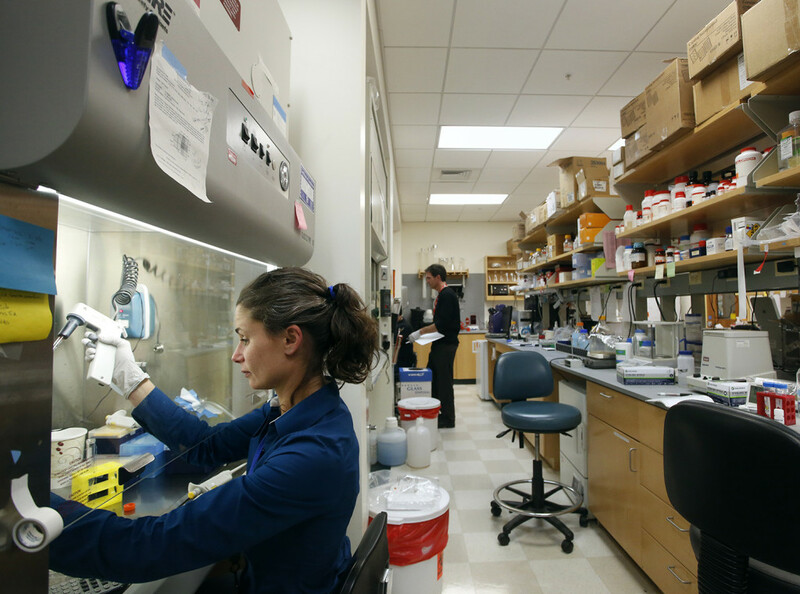 This summer, Oxburgh’s lab landed a five-year $6.8 million grant from the National Institutes of Health. It will hire two more scientists in Maine, as well as scientists in Massachusetts and Texas at labs working in conjunction with Maine Med. 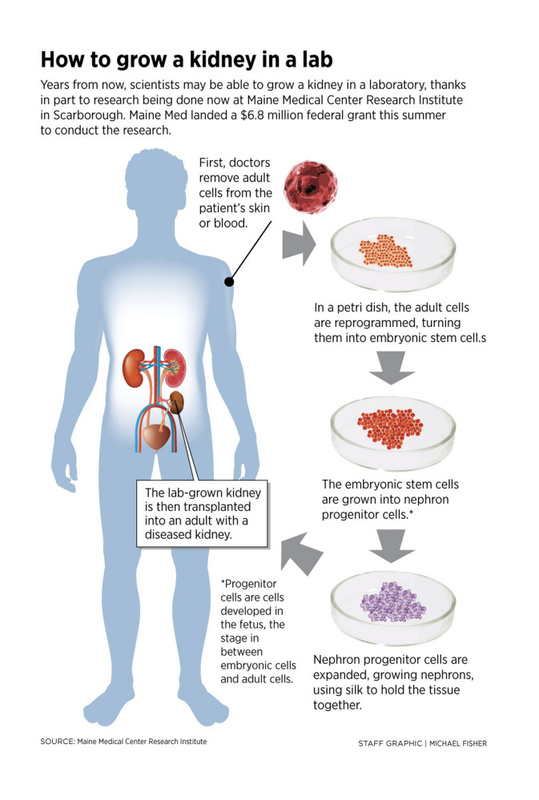 If many years of research proves fruitful, here’s how it would work: A patient sick with kidney disease or cancer could have adult cells extracted from his body, manipulated in petri dishes and grown into a kidney. The lab-grown kidney would be held together with silk “scaffolding” and then surgically implanted. The long-term goal could save thousands of lives, and improve the lives of those previously waiting years for kidney transplants, often on dialysis. Also, unknown thousands of people are ineligible for kidney transplants because they aren’t healthy enough, Oxburgh said. “Some people can’t tolerate the immune therapy, the anti-rejection drugs. This could open up transplants to a huge group of patients who could never get one,” said Oxburgh, excitedly waving his arms. By using cells from a patient’s own body to grow a kidney, theoretically the body should tolerate a lab-grown kidney better than a transplant from another person, he said. Oxburgh said they are so far away from building a kidney in a lab that it’s difficult to predict when it might happen. But he said the science and lab results so far are encouraging. “Mother Nature has many secrets. The human kidney is almost infinitely complex,” said Oxburgh, who has already been working a dozen years on kidney cells. Originally from Scotland, Oxburgh worked at Harvard University for a few years before moving to Maine 11 years ago to study kidney cells. 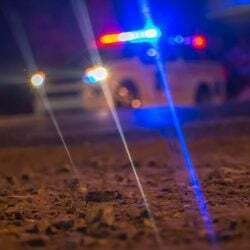 While Oxburgh is downplaying expectations, the research is so promising that his lab is working continuously – in coordination with Tufts University and the University of Texas Southwestern Medical Center – on the project. About 20 scientists around the world are working on furthering research in this field, Oxburgh said. Oxburgh and his team are focusing on the nephrons, the parts of the kidney where waste is filtered from the blood, producing urine. Oxburgh said the nephrons perform a crucial function. “If you didn’t have working nephrons, you would be dead within hours,” Oxburgh said. Each kidney has 500,000 to 1 million nephrons. Oxburgh has built about 50 nephrons in the lab. Oxburgh’s research starts at conception, when a fertilized egg is implanted in the uterus and begins its nine months of explosive growth into a human being. In the beginning, we all have between 16 to 64 stem cells, which in their embryonic state could become any cell in our body – cells for skin, internal organs, the brain. “These are cells that can assume any fate,” Oxburgh said. As the cells and the fetus develop, the role of each cell increasingly narrows, Oxburgh said, until it’s “programmed” into its final destiny, such as a kidney cell or a liver cell. “We are reprogramming the cells, to see if we can turn them back into an earlier state,” Oxburgh said. It’s as if scientists have discovered the “fountain of youth” for kidney cells. He said other researchers have discovered how to reprogram the cells, while his lab is building on that knowledge and learning how to grow them into nephrons. In the lab, the embryonic stem cells are grown into nephron progenitor cells, which are cells that are further along than the embryonic cells, but haven’t yet gotten their final marching orders to turn into specific, adult cells. The progenitor cells develop naturally in the fetus, but are gone by the time the baby is born. The nephron progenitor cells can then be grown into adult nephron cells. But Oxburgh said in order for the nephron cells to be useful, they needed to have something to attach to. Enter silk, which has been studied for years by Kaplan at Tufts University for use in many different medical applications. Oxburgh said he believes silk, which has been used for years in surgeries, will prove to be the essential “scaffolding” for a lab-grown kidney. He showed a slide of lab-grown nephrons – a collection of about 50 nephrons. The bright blue-green splotches formed squiggly lines, which meant that nephrons have formed and are attaching to silk. Kaplan said that the results so far are promising. Oxburgh said that the next step is to manipulate the lab-grown nephrons so that they form patterns. 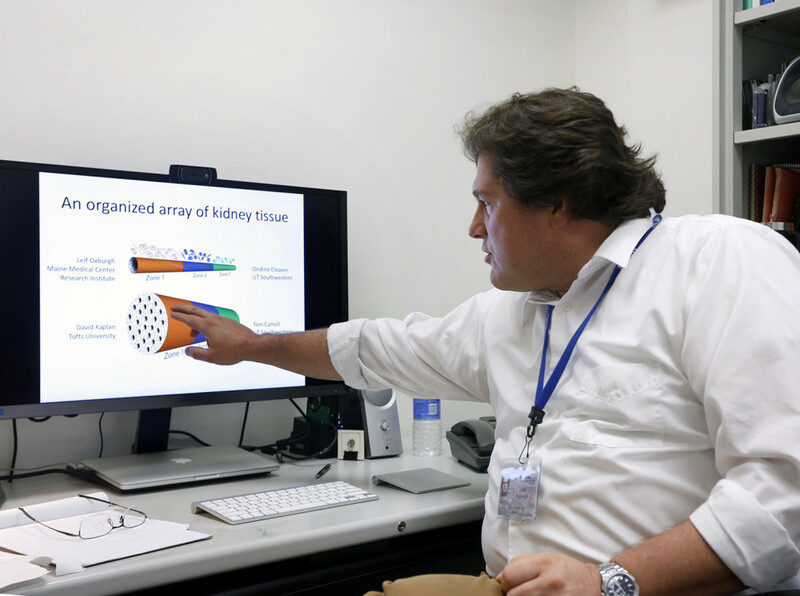 Oxburgh said while the ultimate goal is trying to grow a kidney, along the way it will likely learn useful information about how cells work and develop. That may lead to better therapies for cancers and kidney diseases, for instance, by having more effective drugs to battle cancerous cells. “That is the short-term goal and is well within our reach, within three to five years,” Oxburgh said. Oxburgh’s lab is teeming with petri dishes and cell samples, and researchers busy looking through microscopes and evaluating the results on computer screens. Michele Karolak, research associate at Oxburgh’s lab, was freezing cell samples for future use on a recent day, using what looked like a turkey baster to put liquid into small vials. She has been working with Oxburgh for a decade, and has witnessed “incredible” scientific gains.